Hi and welcome back to this WordPress course. In this video we want to look at posts and pages. So, posts and pages. 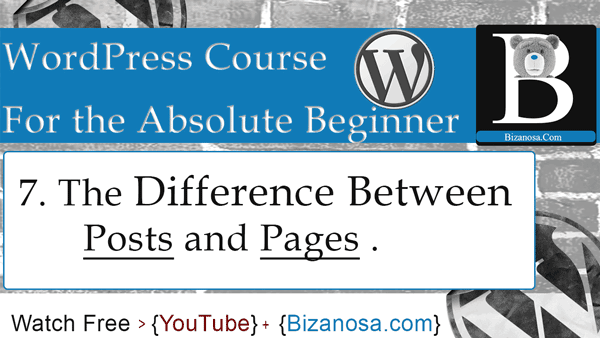 When you are new to WordPress it’s possible to get confused between these two. There is this page on WordPress.Com. WordPress.Com is the hosted platform for WordPress. So if you don’t want to run your own website where you can have all the power to change whatever you need, you can just go to wordpress.com and login or signup and create your blog or Website right there. So your website will be mywebsite.wordpress.com if you don’t upgrade to your individual domain. You can see what you have on WordPress.Com by just going there. If you want to read about the difference between posts and pages just go to this link. Or you can just google, posts vs pages. Or Posts and Pages . That’s what I googled, WordPress posts and pages . And it will bring this as the top result. So basically posts are entries that are in chronological order. Meaning that their dates are important . You create the posts frequently. That is the idea of posts. So that’s basically what creates a blog. The idea that it is done frequently and their dates are important. Then pages. Pages are just static. Meaning, you want a contact page , you just create that page once , put in your contact details . Or you can have an about us page .So that’s the difference between a post and a page.